CIA director George Tenet, right, huddles with CIA Assistant Director Dale Watson during testimony before the Senate Intelligence Committee in 2002, during which Tenet told the committee that Osama bin Laden's al-Qaeda terror group remained the most immediate threat facing the U.S.
William J. Casey, a key figure in the Iran-Contra affair. The list of DCIs also includes a man who went on to hold the nation's highest office: George H. W. Bush. The title of the DCI is actually older than the CIA itself: President Harry S. Truman first used it in a January 22, 1946, presidential directive, when he designated it as the lead position in the Central Intelligence Group (CIG) within the National Intelligence Authority (NIA). It was in this capacity that the first DCI, Rear Admiral Sidney W. Souers, served during his brief tenure (January 23-June 10, 1946). Lieutenant General Hoyt S. Vandenberg (June 10, 1946-May 1, 1947) also served as DCI prior to the establishment of the CIA. The latter was created under the National Security Act of July 26, 1947, which also created the National Security Council (NSC), and it began operation on September 18. On May 1, Rear Admiral Roscoe H. Hillenkoetter became DCI, and on December 19, the NSC gave him orders for the CIA to conduct its first covert operation intended to influence the general elections in Italy so as to prevent a Communist victory. So successful was this effort that the CIA's leadership became convinced of the efficacy of covert action. Despite this success, Truman blamed Hillenkoetter for failing to predict the coming of the Korean War, and replaced him with General Walter Bedell Smith on October 7, 1950. Smith held the position throughout the entirety of the Korean War, and it was under his leadership that the CIA undertook one of its more notorious early covert actions by helping to bring about the overthrow of Iran's Premier Mohammed Mossadegh after the latter nationalized oil fields in his country. Smith resigned on February 9, 1953, after President Dwight D. Eisenhower—on whose staff he had served in World War II—appointed him under secretary of state. Dulles and the 1950s. The accession of Allen W. Dulles to the position of DCI on February 26, 1953, marked the beginning of a new era. Whereas most of his predecessors had served in military intelligence units during the war, Dulles came from the organization of which the CIA was both a successor and an opposite: the Organization for Strategic Services (OSS). Having served as chief of OSS operations in Europe, Dulles brought expertise to the job. Dulles's grandfather, uncle, and brother all served as U.S. secretaries of state, but in contrast to his family's penchant for diplomacy, he favored action. Under his direction, the CIA became highly energetic and enterprising, building both the Berlin Tunnel and the U-2 spy plane, and undertaking covert operations in Guatemala, Egypt, Indonesia, Chile, and the Congo. Despite a number of successes, the CIA under Dulles also experienced several disasters, most notably the shootdown of U-2 pilot Francis Gary Powers over the Soviet Union in 1960, and the abortive invasion of Cuba at the Bay of Pigs in 1961. Though Richard Bissell, one of Dulles's lieutenants, was actually more involved with these two fiascoes, President John F. Kennedy blamed Dulles, and demanded his resignation. The early 1960s. Under John A. McCone, who replaced Dulles on November 29, 1961, the CIA regained favor with Kennedy when it furnished spy plane photos showing Soviet missile emplacements in Cuba, evidence Kennedy used during the Cuban Missile Crisis. Vice Admiral William F. Raborn, Jr. had little background in intelligence when fellow Texan Lyndon B. Johnson appointed him DCI on April 28, 1965. His lack of experience showed in his handling of the U.S. intervention in the Dominican Republic in 1965, when he passed directly to Johnson a great deal of data that had not been processed by CIA analysts. His deputy DCI (DDCI), Richard McGarrah Helms, put a stop to this indiscriminate flow of raw information, and on June 30, 1966, Helms took Raborn's place. Helms: mid-1960s-early 1970s. Helms, who as DDCI had already put considerable CIA resources into the war in Vietnam, built up the CIA office in Saigon at the expense of stations around the world. He vigorously prosecuted the CIA's secret wars in Cambodia and Laos, and under his aegis the proprietary airline, Air America—actually established much earlier—flourished. Yet, for all his pragmatism, Helms maintained an idealism about intelligence work, and this would put him at odds with both Johnson and Richard M. Nixon. First Johnson in the 1960s, then Nixon in the early 1970s, sought to involve Helms in domestic intelligence-gathering. The degree to which Helms willingly participated in these activities is a subject of some dispute, but it is clear that when Nixon sought to involve him more heavily in questionable activities, Helms objected. In particular, Nixon requested secret details involving Kennedy's debacles such as the Bay of Pigs. Nixon relieved Helms of his position on February 2, 1973. James R. Schlesinger had the shortest tenure of any DCI: exactly five months. During that short time, he set about revamping the agency, calling for the firing of some 1,000 employees and compiling a list of agency secrets that his successor would reveal to Congress. For two months after his July 2, 1973, departure, the DCI's position went unfilled; then, on September 4, William E. Colby took leadership. Colby's was an extremely difficult tenure, as the CIA came under intense scrutiny during this time. In a feud with CIA counterintelligence chief James Jesus Angleton, Colby told New York Times reporter Seymour Hersh of a domestic intelligence campaign, Chaos, that he claimed was Angleton's brainchild. Colby did eventually relieve the CIA of Angleton, whose hunt for moles in the organization had become a preoccupation, but the revelations to Hersh set off a flurry of suspicions on Capitol Hill. During the latter part of Colby's tenure, the CIA would come under the scrutiny of multiple congressional committees, and Colby would reveal the details of the secrets compiled by Schlesinger—a list of misdeeds nicknamed "the Family Jewels". The late 1970s: Bush and Turner. Colby retired on January 30, 1976, and was replaced by George H. W. Bush. Despite the overall significance of Bush's career, his tenure as DCI was short—slightly less than one year. Bush did, however, put considerable support behind intelligence-gathering technology, and the Keyhole satellite program flourished under his leadership. In the midst of ongoing debates regarding proposals to transfer the Panama Canal to Panamanian oversight, Bush learned of an effort by a Panamanian lieutenant colonel to purchase U.S. intelligence secrets. Given the volatile atmosphere surrounding the Canal transfer debate, Bush opted not to act against the colonel. Twelve years later, as president, he would unseat the Panamanian, Manuel Noriega, who by then was a general and dictator of his nation. Bush's tenure ended on the day James E. Carter became president, as Carter had his own choice for DCI: Admiral Stansfield Turner, who took office on March 9, 1977. Although Turner was an old Naval Academy classmate of Carter, the two men barely knew one another at the time of his appointment. In contrast to the early days of CIA when DCIs tended to be military officers, Turner, who retired from active duty in December 1978, had been the only military officer to serve in the position since 1966. Turner continued Bush's emphasis on intelligence collection via satellite, and favored electronic intelligence over human intelligence. This preference had much to do with his desire to distance the agency from its old practices, and covert operations declined dramatically under his leadership. The value of those decisions came in to question, however, when the CIA was later in a poor position to gain and analyze intelligence from human sources that could help foresee or intervene in events such as the Soviet invasion of Afghanistan or the Islamic fundamentalist takeover in Iran. The 1980s: Casey. Whereas Turner was an outsider—a military man whose methods sometimes clashed with the culture of CIA—William J. Casey, who replaced him on January 28, 1981, was an old-time spy. As the last of the former OSS men—a group that also included Helms and Colby—to serve as DCI, Casey ran the agency as a fiefdom, and kept as much secret from Congress as he could. 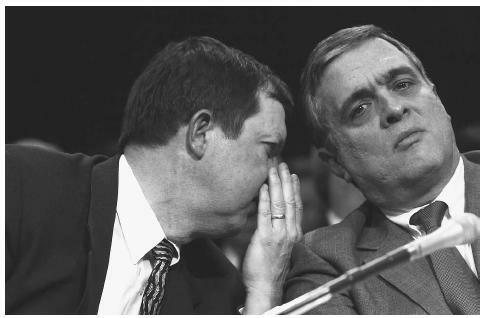 The CIA's budget, size, and influence grew enormously under Casey, who enjoyed strong support from President Ronald Reagan. Casey reportedly directed funds and arms to rebels fighting Communist regimes in both Afghanistan and Nicaragua, and became heavily involved in the Iran-Contra affair. How great that involvement was may never be known, in part because Casey's staff deceived Congress regarding their activities, and in part because Casey died on January 29, 1987, before he could testify. From the mid-1980s to the present. William H. Webster has been the only man to serve both as FBI director (1978–87) and DCI (May 26, 1987-August 31, 1991). He sought to reform the abuses that had occurred under Casey, while strengthening counterintelligence. However, the degree to which counterintelligence was strengthened would be open to question after the revelation in 1994 that the CIA had long had a highly paid Soviet mole, Aldrich Ames, in its midst. Before becoming DCI on November 6, 1991, Robert M. Gates had already served as DDCI for many years, and even served as acting DCI during Casey's illness. As DCI (a job to which Bush appointed him), he led the redirection of CIA efforts away from their Cold War orientation, and toward a focus on issues such as nonproliferation, terrorism, and drug trafficking. During an October, 1992 visit to Moscow, Gates did something inconceivable for a DCI in Dulles's time: he entered the Kremlin. "At the end of the day, this is an espionage organization. It must generate information that is unique…otherwise we don't know why we are here. We no longer are in search of a mission. We know what the mission is, we know what the targets are." The DCI serves a triple function: head of CIA, principal intelligence advisor to the president, and director of the Intelligence Community. He reports to the president, both directly and through the national security advisor and/or the NSC, of which he is a member and intelligence advisor. DCI oversees the preparation of the annual CIA budget, which is in turn part of the Intelligence Community budget, a request he presents as a whole to the president. DCI is also responsible for directing and coordinating national foreign intelligence activities, though he only exercises direct authority over the CIA, as well as some staff organizations outside the agency. The latter include the National Intelligence Council (NIC), which is responsible for preparing national intelligence estimates, and the Community Management Staff, which assists him in his executive functions as chief of the intelligence community. He also chairs two intelligence advisory boards, the National Foreign Intelligence Board and the Intelligence Community Executive Committee. As head of the CIA, the DCI oversees a vast network of offices, and is involved in several offices within the directorate of intelligence that are concerned with issues that affect national security in the twenty-first century—namely, drug trafficking, terrorism, and weapons proliferation. These offices are the DCI Crime and Narcotics Center (CNC), the DCI Counterterrorist Center (CTC), and the DCI Center for Weapons Intelligence, Nonproliferation, and Arms Control (WINPAC). Working on behalf of lawmakers and the law enforcement community, the CNC collects and analyzes information on international drug trafficking and organized crime. Its staff is made of a diverse array of personnel trained in areas ranging from international finance, to remote sensing, to foreign languages. Its strategic analysts prepare papers and briefings on both long-term trends and late-breaking events, while its targeting analysts conduct indepth research of high-priority criminal and drug-trafficking organizations. Operating support specialists and program managers assist colleagues overseas with up-to-the-minute information on crime and narcotics issues, and remote sensing and geographic information specialists use cutting-edge technologies to detect narcotics crops and manufacturing facilities overseas. The CTC is actually independent of the directorate of intelligence, although its Office of Terrorism Analysis (OTA) belongs to that directorate. Established by Casey in 1986 upon the recommendation of a task force chaired by then-Vice President Bush, CTC is designed to assist DCI in coordinating Intelligence Community antiterrorism efforts. OTA, its analytic component, monitors and assesses crosscutting issues and emerging trends in terrorism. Its responsibilities include tracking terrorists, analyzing worldwide terrorist threat warning information, assessing terrorist issues that cross national or regional boundaries, and producing intelligence to help interdict the flow of funds to terrorist organizations. WINPAC provides intelligence support to U.S. policymakers the military with the aim of protecting the United States and its interests from foreign weapons threats. Its staff includes mathematicians, engineers, physicists, economists, political scientists, chemists, biologists, and others. It studies the development of weapons across a broad spectrum, including weapons of mass destruction, advanced conventional weapons such as laser devices, and missiles. It monitors strategic arms control agreements, and supports military and diplomatic operations overseas. Colby, William, and Peter Forbath. Honorable Men: My Life in the CIA. New York: Simon and Schuster, 1978. Grose, Peter. Gentleman Spy: The Life of Allen Dulles. Boston: Houghton Mifflin, 1994. Montague, Ludwell Lee. General Walter Bedell Smith as Director of Central Intelligence, October 1950-February 1953. University Park: Pennsylvania State University Press, 1992. Persico, Joseph E. Casey: From the OSS to the CIA. New York: Viking, 1990. Powers, Thomas. The Man who Kept the Secrets: Richard Helms and the CIA. New York: Knopf, 1979. Prados, John. Lost Crusader: The Secret Wars of CIA Director William Colby. New York: Oxford University Press, 2003. Thomas, Evan. The Very Best Men: Four Who Dared: The Early Years of the CIA. New York: Simon & Schuster, 1995. Turner, Stansfield. Secrecy and Democracy: The CIA in Transition. Boston: Houghton Mifflin, 1985. Central Intelligence Agency. < http://www.cia.gov/ > (April 24, 2003). Central Intelligence Agency. Federation of American Scientists. < http://www.fas.org/irp/cia/index.html > (April 24, 2003).